Grow Cucumbers You're Going to Love Eating! | Grow Your Own Veg Blog. Gardening and Food Blog. Grow Cucumbers You're Going to Love Eating! The cucumber must be one of the most underrated vegetables in the world. Often labelled as tasteless and bland, it has more recently, through no fault of its own, been ostracised from the world of salad making, all due to mankind's excessive use of the thousand island dressing and mayonnaise during the eighties, which has subsequently led to an entire generation of cucumber haters. Yet, it is most impressive how universal and well travelled this vegetable-fruit is and no matter which country I have lived in, it is always stocked on supermarket shelves and is always featured on menus locally. 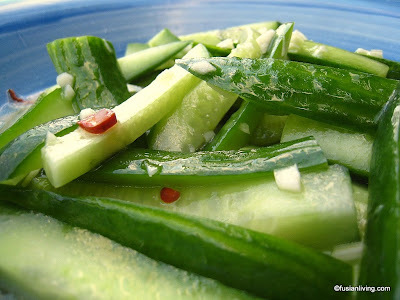 In South East Asia, the cucumber plays a very important role in local cuisine; in Malaysia for instance, you wouldn't go a day without eating cucumber, which is served raw with everything from satay skewers to coconut rice and chillied anchovies (sambal) in the highly popular "nasi lemak". And what would a Thai beef salad be without cucumber? In China, cucumbers are eaten pickled or stir fried with pork, and in other countries across the Asia Pacific like Japan, a smaller variety of cucumber is rolled into sushi rolls. And of course there is the Greek salad of cucumber, tomatoes, olives and feta that features prominently in Australian cuisine. And then, in England, there are the traditional cucumber sandwiches, which I discovered during a champagne afternoon tea at the Claridge's hotel in Mayfair, London. I am so glad it was explained to me (by my lovely friend who I was with), that these were traditional finger food and that even the Queen served these for tea, because for half a minute, I did wonder if the chef had accidentally left out the filling! But it was, indeed, a lovely setting and the quality of the bread was really superb. 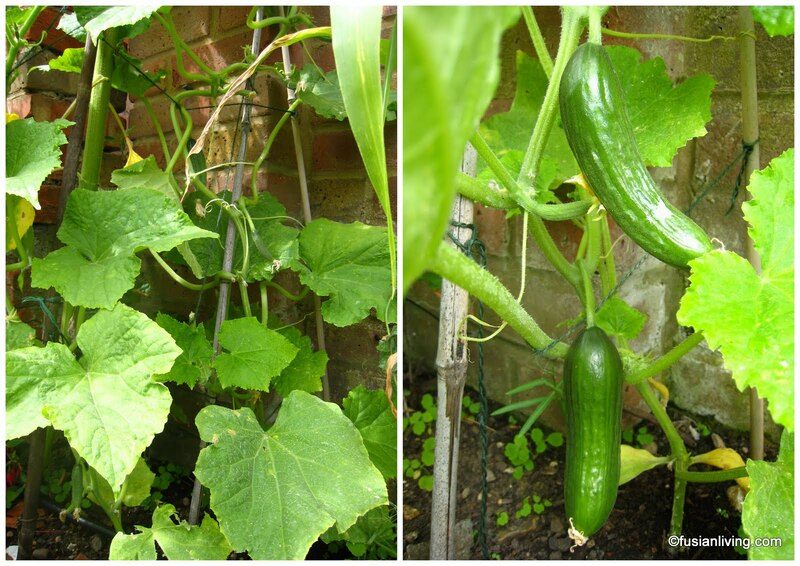 We have put in two cucumber plants which we bought as seedlings from a garden centre back in June. They are growing in a sunny spot and are being supported by canes and twine, so that they climb upwards which means the fruit will hang off the plant and not be left on damp soil which would make them rot. This also clears up space on the ground for other plants. First, you get these little green baby cukies with a bright yellow flower, then as they get bigger, the flowers will dry up and fall away. 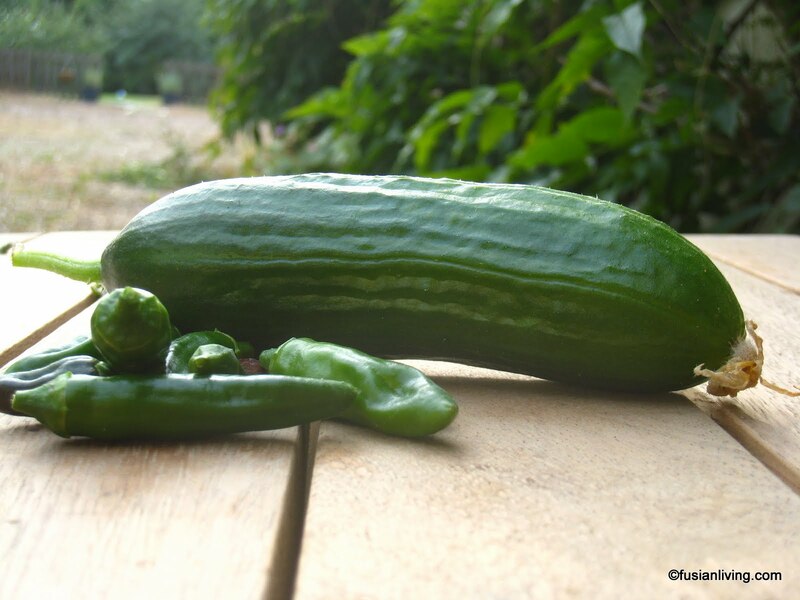 Last week (end of July), we were able to harvest our first two cucumbers. The variety we are growing are "Mini Cucumbers", which is exactly what I was looking for, because you can harvest them quite small and the skin does not have any of the bitterness and toughness that some of the larger cucumbers have. 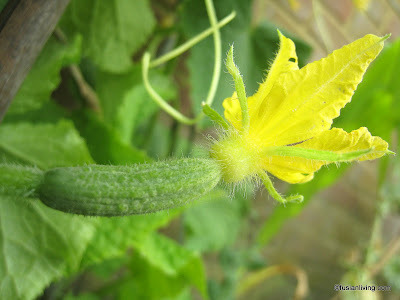 So far, we are still having a good run with the cucumbers and have not encountered any major pests. And now that our tomatoes are also ready for harvesting, I am desperately looking forward to making a Thai beef salad with our next batch of mini cucumbers with more garlic and fish sauce....! Whoever said cucumbers had to be tasteless and boring? Not me! !